Rob Fishel arrived in Portland from Baltimore in 1999. He holds music degrees from Reed College and Portland State University, and has been a freelance musician in the Portland area since 2005. He serves as rehearsal pianist for various vocal ensembles (including the Reed Chorus), directs the music program at Pioneer United Methodist Church, and frequently appears as music director or accompanist in Portland’s musical theater scene. Rob was first drawn to the accordion in high school. With some surprise, he saw his casual interest grow into a serious pursuit alongside the study of piano and organ, and he has since used the instrument in many professional contexts. 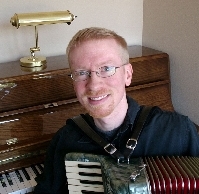 Beyond traditional applications in folk music, Rob also advocates for the use of accordion in classical music, and enjoys presenting arrangements of piano and organ repertoire in concert. This is Rob's third year teaching at Reed.